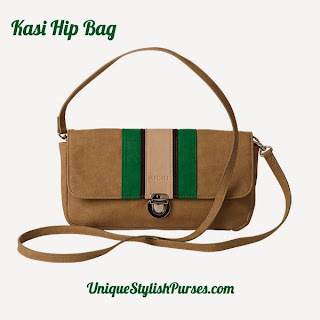 The Kasi Hip Bag’s color-blocking is chic and on-trend, yet the styling is classic and timeless. Gorgeous faux suede in chamois, black, latté and brilliant green comes with matching long strap—and the interior is lined with adorable black with green polka-dot fabric. Zipper closure with metal push-lock closure (silver hardware). Bag is completely self-contained—it is not interchangeable like our traditional bags. Dimensions: 5” tall x 10 ¼” long, with a 1 ½” gusset; handle is 54” long x ½” wide with a 27 ½” handle drop.